Use the Knack API to create, retrieve, update, and delete your apps' records. Use CSS to customize your application's design, including the layout, colors, and text. Several examples of each are provided at the end of each section. If you have a code example you’d like us to include in these docs, please do so by using the form located here. We’ll review the code and add to the docs as soon as possible. The Knack API is organized around REST. Our API has predictable, resource-oriented URLs, and uses HTTP response codes to indicate API errors. We use built-in HTTP features, like HTTP authentication and HTTP verbs, which are understood by off-the-shelf HTTP clients. Our API follows most conventions of RESTful architecture. Any requests which require authentication must always be authenticated, as our servers do not retain information from previous requests. Our routes are reliably simple and require only a few levels of nesting. All data sent to and from the API must be in JSON format. Many coding languages include utilities to convert data structures to JSON strings and vice versa. We provide example API requests throughout the documentation. Each example is from the Contact Directory template app. You can add this app into your own account, but note that you will need to replace the placeholder header values and record IDs in these requests in order to get them working with your own apps. The API is used to make requests to create, retrieve, update, or delete records that are stored in your Knack apps. Requests are made for records from either a specific object in your app or a specific view on one of your pages. Object-based requests require an API key and have full access to every field and record in your app. View-based requests follow the rights and fields that were set up in the view, so no API key is required. For example, requesting records from a table view would only return fields for the columns that are included on that table. All requests are authenticated via HTTP headers that need to be passed in with each request. Note that you can make a maximum of 10 requests to the Knack API per second, while your plan will determine your daily API call limit. Read more about limits here. Object-based requests give you unrestricted access to create/retrieve/update/delete records in all fields on all records for a specific object. Every object-based request requires authentication with an API key. When you are making requests from server-side code which you maintain and where you can secure your API key. When you want full access to all fields and records. When you do not want to retrieve/create/update records based on a view and/or a logged-in user. Object-based requests require at least two headers: an application ID - to identify to our servers the app whose records you are requesting - and an API key (which is specific to each app) to authenticate the request. PUT and POST requests require that you tell our servers explicitly that your payload is in JSON format via the content-type header, whose value should always be application/json. Views on pages which are protected by logins require authentication by a user token. 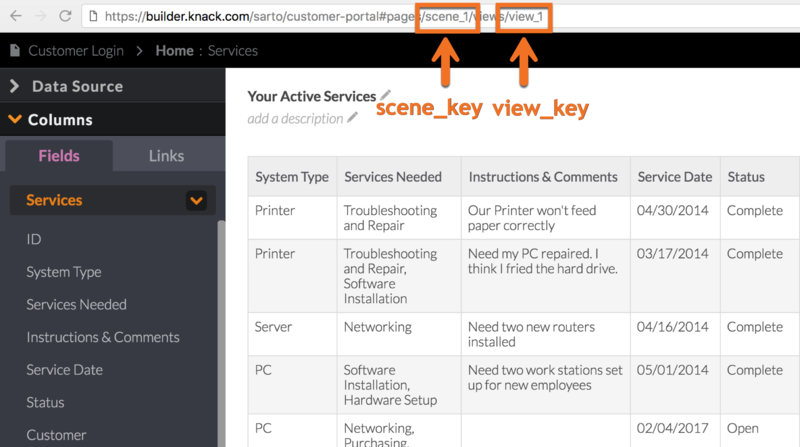 View-based requests require at least two headers: an application ID - to identify to our servers the app whose records you are requesting - and the value of knack for the API key header; note that you should not include your actual API key in view-based requests. To authenticate requests to views on pages protected by logins, you will need to use the Authorization header whose value should be a user token. Note that PUT and POST requests require that you tell our servers explicitly that your payload is in JSON format via the content-type header, whose value should always be application/json. Records stored in your app are indexed by the field key (e.g. field_1) and include a unique record ID which you can use to specify that record in subsequent requests. The information and examples below demonstrate how each of Knack's field types is formatted in the JSON you will send and receive. Short text values are stored as strings. Paragraph text values are stored as strings. "Knack is the easiest way to build online database apps." Number fields are stored as numbers. Yes/no fields store boolean values, though you can use either strings or booleans in your PUT and POST requests. Note that you can use "yes," "on," "false," or "off," as well, and that the API is not case-sensitive with these values. Name fields are stored as objects with a title, first, middle, and last name, each of which is a string. Email fields are stored as objects with an email and label, each of which is a string. Multiple choice fields come in two variants: one selection (string) and multiple selections (array of strings). Date/time fields have four variants, each of which is an object with its own type of formatting: single date as object, single date as string, from-to date/all day, and time-only. See below for an example of each. Note that the type of date format selected for the field in question (in the Builder) will determine the format in which you should enter the date. String dates will also be parsed and converted into the correct object. Read more about these settings here. "02/08/2013 5:00pm to 02/11/2013 3:00pm"
Address fields are stored as objects with string values for street, street2, city, state, zip code, and, if international, country. The settings which determine this format are set in the Builder and explained in further detail here. "street": "123 Fake St., Apt 2"
Link fields are stored as objects with a URL and, if applicable, a label. Rich text fields are stored as strings. "<h1>I'm a Title</h1><p>I'm some <strong>bold</strong> text</p>"
Currency fields are stored as numbers (note that the type of currency is therefore not included). Auto increment fields are stored as numbers. Note that auto increment fields are read-only. Rating fields are stored as numbers. Timer fields are stored as an object with an array, "times", which consists of of an object for the "from" and "to" time, each. Formulas - counts, sums, etc. - are stored as numbers. Note that formula fields are read-only. Connections are stored as arrays of record IDs (strings), even when there is only one connected record. Each of these is the ID of a record of the object to which this field connects. Image fields are stored as objects with their ID, application ID, file name, thumbnail URL, and other information. Read more about uploading images here. Files are stored just like images. Read more about uploading files here. Records stored in your app are indexed by the field key (e.g. field_1) and include a unique record ID which you can use to specify that record in subsequent requests. See below for a examples responses you might see for a GET request for multiple records as well as for any GET, POST, or PUT request which returns a single record. When retrieving a single record via a GET request, inserting a record via a POST request, or updating a record via a PUT request, the JSON body of a successful response will be the record in question as a JSON object. The Knack API uses status codes in the 200 range to indicate success and status codes in the 400 range to indicate an error. Codes in the 500 range indicate a server-side error. Most errors can be fixed by checking the JSON formatting of your request’s body (there are plenty of great online JSON validators), your application ID, and (for object-based calls) your API key. 400 Bad Request Any Malformed App ID. 401 Unauthorized Any Invalid API request Results from no application ID included among request headers. 403 Forbidden Any Invalid or Expired Token Results from trying to authenticate a view-based request with an expired user token. When you make many API requests within a short amount of time, you may receive a 429 Too Many Requests response back. When you reach the daily or rate limit, Knack will stop processing any more requests until a certain amount of time has passed. For all plan types, there is a rate limit of 10 requests per second. If you’d like to increase the number of requests you’re able to make in a day, please fill out the form located here. All object-based API calls count against your API limits. All view-based API calls which are authenticated with a user token count against your limits. Requests made by Zapier and other 3rd party integrations count against your API limits. View-based API calls which are not authenticated with a user token - that is, requests whose URLs refer to scenes/views which are not protected by a login - do not count against your limits. For this reason, adding a new page, removing it from the page menu, and using that page for API calls can be a smooth method of avoiding hitting your daily limit without cluttering up your app (your users will not know this page exists, unless they have its URL, since you removed it from the page menu). We strongly recommend that any code which interacts with our API catches any errors caused by hitting our rate limit, since your code can wait under a second for the limit to expire and then retry the failed request. Upon hitting the rate limit, the HTTP response which you’ll receive from Knack will have the HTTP status code 429 Too Many Requests with the message, “Rate limit exceeded”. Every request after this, until the one second is up, will continue to produce these errors and your requests will be ignored by Knack. With the above response information in mind, you would be able to alter your script to catch rate-limit errors and alter your next requests accordingly. Optimizing code to remove any requests that may no longer be vital to your app’s functionality. Find any requests you make but whose returned data you do not actually use. Caching frequently requested data that doesn’t change. This could be saved either client- or server-side; better yet, you could simply move the data to the page itself as text (or other format) instead of requesting it from your Knack app. Check if your third-party integrations (e.g. Zapier) are pushing you over your daily limits. With multiple users on the Live App and a third-party integration all making calls at the same time, your rate limit could easily be exceeded. Wait for a response from the previous request before continuing with another request. In the majority cases, this will add enough of a delay between requests to prevent you from reaching the rate limit. This will not prevent you from hitting your daily limit however, and we suggest referring to the section above - Reducing the Amount of API Requests - for information on how to avoid this. Add just enough of a hard-coded delay between requests to prevent yourself from hitting the rate limit. This can take some trial and error as well as monitoring the number of requests being sent and their responses, to get right. Include a counter variable to track the number of requests you are sending in order to group the requests as a batch. Once you hit the magic number of 10 requests, check the X-RateLimit-Reset header’s value - and wait until that timestamp has passed - before sending the next batch of requests. You can create records through both the object-based and view-based APIs by sending a JSON payload of your record in a POST request to the appropriate route. Note that at this time, only one record can be inserted in a single request. For multiple insertions, your code will need to iterate over a collection of data and make a POST request for each. See our tip on making requests which do not count against your rate limits here. Only fields set as required in the Builder must be included. Any field not included will be set to its default value. If the field does not have a default value it, will be left blank. Note that some fields require special formatting or structures; see the section on field types for information on how to structure your JSON for each of our field types. Note that in the following sections, we give examples in CURL format. These can quickly be converted into any language of your choosing by using a tool such as Postman. This is a two step process where step one would be to import our CURL example into Postman, and step two is to have Postman generate code in your preferred language. Note that the only fields included in your payload should be the ones included in the form itself, as no others will be included. Also keep in mind that all relevant record rules on the form in question will be triggered by a POST request to that form. You can retrieve your records by making a GET request to the appropriate route as outlined below. You can either query for up to 1,000 records at once - including with field-specific filters - or retrieve a specific record by its ID. Note that at this time, to retrieve more than 1000 records, you will need to programatically loop through your object utilizing our Pagination, until all required records are retrieved. You can retrieve multiple records at once - just like the Builder and your Live Apps' table and list views do - by making a GET request to the appropriate object- or view-based URL. Note that this is abbreviated - only two records are included out of the response's fourteen. Read more about how to interpret this information here. Note that the only fields included in the response will be those included in the view specified in your URL, and that the view's data source will impact the records which your requests retrieve. Also note that are fields included here which do not appear in the response to our object-based GET requests; this is because the table used in this example - the Companies table - includes a column for Contacts. "field_14": "<a href=\"#58643557d1ea9432222f3cd1\"><span id=\"58643557d1ea9432222f3cd1\">Barbara Waters</span></a><br /><a href=\"#58643558d1ea9432222f3ce9\"><span id=\"58643558d1ea9432222f3ce9\">Josefa Willems</span></a>"
"field_14": "<a href=\"#58643557d1ea9432222f3ccc\"><span id=\"58643557d1ea9432222f3ccc\">Daniel Navarrete</span></a><br /><a href=\"#58643558d1ea9432222f3cd9\"><span id=\"58643558d1ea9432222f3cd9\">Mark Silverstein</span></a>"
You can retrieve a specific record by making a GET request with the record's ID appended to an appropriate view- or object-based base URL. Note that the only fields included inthe response will be those included in the view specified in your URL, and that the view's data source will impact the records which your requests retrieve. Filters are used to search and limit the records returned by GET requests for multiple records. Filtered API requests return the same results as a filtered table in your Live App or Builder. Just like in the Builder and Live Apps, you can specify that the records retrieved match either all or any of your filters. When creating filtered endpoints, a good way to confirm that the formatting is correct would be to go into your records from your App’s Builder, and apply the same filters to one of your objects. The URL displayed there will be similar to how you want to format those filters on your own API endpoint. Begin by adding a filters parameter to your URL. Its value should be a JSON object with two keys: match and filters. The value for match should be either "and" or "or". "and": all records retrieved will match all of your filters. "or": all records retrieved will match at least one of your filters. Below is a list of Knack's field types along with your options for the operator value for each. The example which follows along with the steps below uses two objects: Employees and Companies, where many Employees connect with one Company. The connection field is on the employee, and it is called Employed By. The example explains how to query for Employees connected to a specific company, Knack. Identify the parent record by which you want to filter a request for child records. Make a request for this record by querying the parent object with a filter for the record’s Display (or any other unique) field. Example: Identify the Company record by which you want to filter a request for Employees. Make a request for this record by querying the Company object with a filter for the record’s Company Name, for instance. Locate the Connection field, which is usually on the child object. Select it in your Builder and note the field key at the end of your URL. Example: Employed By field on the Employee Object. Let’s say the its field key is field_12. Add your filter using the Connection field, the is operator, and the parent record’s ID for a value. Knack offers additional parameters to help format, sort, and paginate the records you retrieve with GET requests. You can choose any of the three data formats listed below by appending the format parameter with your choice, to your request's URL. All response data is formatted both by default. Using field_25 as an example, with both, your response data will include field_25 and field_25_raw (HTML formatting). With raw, your response data will only include field_25, which will be the same value as field_25_raw with the both formatting. The API can return up to 1,000 records at a time, meaning that retrieving more records will require multiple requests, where each would specify which page - or set of (up to 1,000) records - to retrieve. rows_per_page: Number of records to return from one request. page: If total_records (from the response) is greater than rows_per_page, use this to return a subset of records. Because this example requests page 2 with 25 records per page, it will retrieve the 26th through 50th records. Because this example requests page 3 with 100 records per page, it will retrieve the 201st through 300th records. You can update an individual record by making a PUT request to the relevant base URL with a record ID appended. Note that you will need to construct a JSON payload just like the one you would need for a POST request, where the only difference is that only fields included in your payload will be updated; all others will remain unchanged. 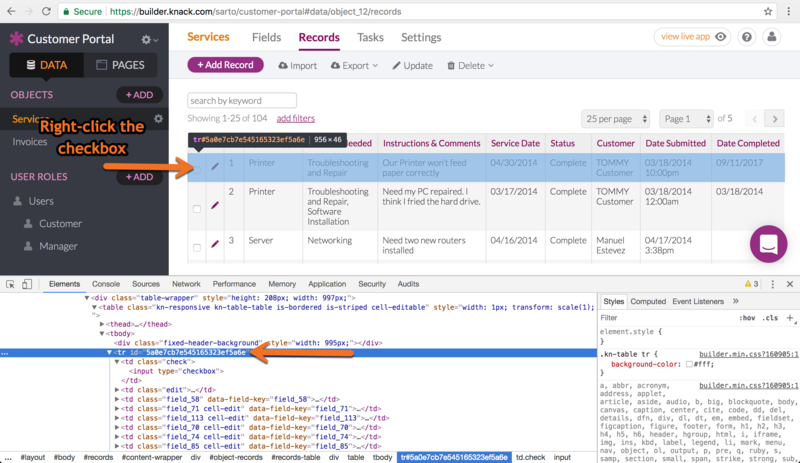 One way to find a record ID, outside of an API response, is to grab it from your Builder. You can do so by navigating over to your records in the Builder. Although this is easiest done with Chrome, similar steps can be taken from most browsers. From the object, make sure you’re looking at your records and then right click near the checkbox on the record's row you're working with, then click on Inspect Element. You’ll see a console window open up. From that window, find the table row element for that specific record and notice the ID is a long string of characters. This is the unique record ID that can then be used in your custom code. We also have an example on how to find and store record IDs in a field programatically here. The URL should include the object key and a record ID, while the headers will include one for content-type as well as those for authentication. To change the data stored for a record which already exists, send a PUT request to the URL for an edit form with the record key appended. Note that the only fields included inyour payload should be the ones included in the form itself, as no others will be updated. Also keep in mind that all relevant record rules on the form in question will be triggered by a PUT request to that form. "field_1": "New name of new company"
You can delete a single record by making a DELETE request to the relevant base URL with the record's ID appended. Uploading a file or image via the Knack API is a two step process. The first will perform an HTTP POST request with a multipart/form-data content type to the following URL: https://api.knack.com/v1/applications/app_id/assets/file/upload. The second step is to then create a new record using the information from the response in the first step. This response contains an id property that you will use in the next step. The public_url property will contain a direct link to the file itself, and the thumb_url property will contain a link to a thumbnail if an image was uploaded. Use the file_id from the JSON response to make a second POST request to create a record referencing your file. Set that file_id to your image or file field. This section covers how to authenticate view-based requests as a logged-in user so as to make requests to pages which are protected by logins. User tokens are secure keys which are generated when a user logs in. By using a token as the value for the Authorization header in a view-based request, you can make secure, cross-origin requests as a logged-in user without exposing an API key. Because the token identifies the specific user who retrieved it by logging in, token-authenticated requests behave just like a user's visit to your live Knack app; the authenticated user can only make requests to views to which he/she has access, and any forms whose record rules track the logged-in user will identify the user by this token. Similarly, requests to views which display records connected to the logged-in user will only return those same records. If the 'Remember Me' box is checked upon login, tokens are valid for two weeks after which they are replaced with new ones when the user logs in again. Otherwise, a user's token is good for 48 hours after login. Note: You may notice that this header is not prefixed by “X-Knack-”. That’s because the authorization header for use in a token-based authentication systems is an industry-standard approach as defined by this Internet Engineering Task Force proposal. 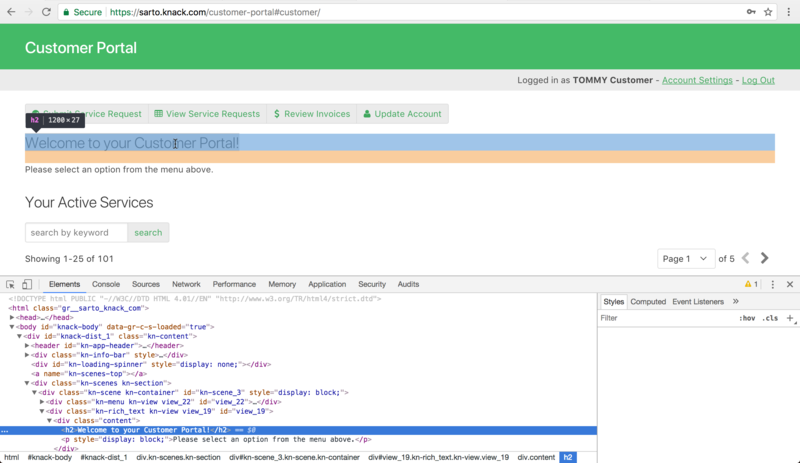 See below for an example of using jQuery in a Knack app to determine a user’s token and then to make an API call using it. Note that there is no API key included in the headers. Your response will look like the following, where you will want to store the value of token in a variable to use to authenticate your view-based requests. Using the Contact Directory template app as an example, let's get all of the Contact records which belong to the Company "BASCO". // Prep request for the Company with the name "BASCO"
We can use the scene URL parameter to specify which page of results we want, while we can minimize the number of records included per page with the rows_per_page URL parameter. Read more about these here. In this example, we use recursion to retrieve each subsequent page of records. Because we are making these API calls asynchronously, we handle the results with a callback function. A page with a form to edit records for that object (example below: scene_2/view_3). This form must contain an input for the short text field you use to store the ID. To prevent using up API calls which count toward your daily limit, you can remove this page from the page menu instead of protecting it with a login, freeing you up from needing to authenticate your PUT request with a token. This example inserts a record connected to one which was just created via a form submission by using the record's ID - in an array - as a value for a new record's connection field. The following are examples from our Attendance Manager example app. These functions insert Attendance records for each Student connected to the Teacher’s class. So instead of having to manually insert a new attendance record for each student, the Teacher can use inline editing instead to mark any students as absent. These handlers can contain custom code to extend your app beyond the functionality included in the Knack platform. For example, you could respond to a form submission event to insert that submitted data into a separate CRM or into your own database through a server whose code you maintain. Code inside these event listeners will be executed whenever a scene or view - depending on your listener - is loaded. They are used most often either for manipulating the HTML/CSS of the view to make visual changes or to make requests to Knack's or other external APIs for specific scenes/views. Only runs once per page load - consider view render event listeners if you want your code to execute every time a form view is reloaded after submission, for example. Keep in mind that if you use knack-view-render.any, your code will be execute once for each view on each page, so a page with four views will run the same code four times. view a JSON object of the view. record a JSON object of the record deleted that was stored in the view. These are simple function calls you can use in order to get information about your app or user, trigger specific interface events, and more. This section is currently under construction; we will have new functions here soon! This function gets you all of the logged-in user's information stored in his/her record. See the table below for how the basic information is returned. If a user is not logged-in, the string “No User Found” will be returned. Returns the logged-in user's token (string). When no parameter is provided, this function returns an array of object keys representing the user roles to which the user is assigned. // The first parameter is an array of files to load. // The second parameter is a function to execute after all the libraries have completed loading. It also passes in the Knack jQuery object as the first parameter, $. Knack uses a sandboxed jQuery object in order to prevent conflicts with other jQuery versions you may be using. This function can only be defined once. The following code examples have come from common requests, projects we've loved, code which users have shared with us, and other sources. Many of these examples showcase how easily jQuery can be leveraged to make considerable changes UX within your app, such as hiding or showing specific elements in a specific view when certain conditions are met. Another very common use for jQuery in custom code is to make AJAX calls from your Knack app. These often go to external - or you own app's - APIs. For some examples of this, take a look at our API code examples. This allows you to add color to specific fields. For example, showing the word “Expired” or “Rejected” in red text, or maybe making the text green if it is “Approved.” This example will change the text to red if the value is “Expired” otherwise it sets it to green. This example allows you to move the Signup link above the log in form. You could also add other CSS to the link to make it more visible if you wanted. This example allows you to set a specific validation requirement for a field when submitting a form. This example allows you to add checkboxes to a table, including a check all/none checkbox in the header. This will move the backlink (ex. “Back to Client”) at the bottom of the page, directly below the crumbtrail (ex. Client > Client Details) at the top of the page. This will change will affect every page in the app. This example will disable the text input field in a form. This example will replace the HTML for all back links in the app. This example will convert any text you input in the specified text to UPPERCASE as you type it. This example will capitalize any text in the specified input and ignore all characters after the first one. This example demonstrates how to programatically update a connection field in a form view. You will need the record id for the connected value to populate the field and then trigger an update on the dropdown field to visually render the change. This example will change the range of time options available in the timer field in a form. This example will change the 'add filter’ text for any view. This example will redirect the user after they submit a Checkout form. This example will redirect the user to the https page, if they load a page at http. This example changes the placeholder text for a keyword search. Note: This code example will only applies to the Keyword search field shown on Table and List views. This example will move the instructions on a form field, above the input box. This example will submit a form when a page is loaded. This example will use the Knack API to autosave changes to a field while the field is edited. // If the data is the same... don't save it! This example will hide tables that contain no data. // Loop through each scene view, on the page. // Remove the specific view. This example will allow you to redirect users to a specific page after they logout of the Live App. This example will allow you to change the start date when a calendar view is loaded. This example will allow you to change the tab name when a page is loaded in your Live App. This example will allow you to use a personalized icon when user's save the Mobile Web App to their Home Screen. This example will allow you to get the raw data from a Signature Field inside a form. Knack apps are easy to customize with your own CSS (Cascading Style Sheets). If you are familiar with CSS or have access to web designers you can completely customize the look and feel of your Knack app. In order to make CSS changes to your app, first you'll need to know how to find the elements to target, to apply the CSS styles to. The following sections explain how to do this a bit more. HTML tag selectors: These selectors target specific elements on the page. For example, “p” for the paragraph element or “h1” a heading element. Using these will allow you to narrow down which areas of your app you would like to target with your CSS. The easiest way to get started is to use a DOM inspector that comes with modern browsers like Chrome and Firefox. You can inspect an element in the Knack app and the inspector will show you which classes and IDs you should modify. The following is an example of inspecting an element in Chrome, where you can see that “My Service Requests” can be targeted using the “h2” tag. First, right-click on the text you're interested in modifying. In the below example, we right-clicked on 'Welcome to your Customer Portal'. Next, from the dropdown of choices, choose 'Inspect Element'. In order to modify the Knack styles you’ll need to assign a priority to your own styles that become more important than the default Knack styles. Styles will cascade (the first “c” in CSS) by priority, so you need to make sure your styles take higher priority than the Knack styles. !important: The second way is to add the ”!important" attribute at the end of the style, which will tell the web browsers that this CSS code takes precedence over any others that may exist. WARNING: !important should be used carefully, as it can sometimes override other aspects of your styling. This style is now more specific and will be prioritized over the Knack style. When you publish your Knack app to your own website or blog, that app is added directly to your website’s HTML code. This means that it will follow any CSS rules you’re including for that web page. A Knack app will typically follow your font and link color styles by default. You can also add additional CSS styles to modify the default Knack styles. Any styles added to the same page you publish your app to will be applied to the HTML of your Knack app. When embedding, the styles from your external site will not affect the app when viewed directly at knack.com; they will only affect the embedded version of the app. These styles will affect both the knack.com apps and any published apps. Below are fairly simple snippets which address several of the most common scenarios which require custom CSS. This example forces a set width for a column. You might find this example useful if you only want your users to sign-in through SSO. This example will hide the last Totals row in a grouped table. Only displaying totals per group. This example will change the background color for all labels in a view. This example will hide the crumbtrail (Ex. “Project > Project Details”) at the top of the page for the entire app. This example will hide the entire logo header at the top of the app. This example will hide the menu from the top of the app. This can work well in combination with the Hide the Logo example above if you just want to include a single page or form without the rest of your app. This example will remove the third cell in the final (summary) row of a pivot table, allowing you to hide, for example, an unnecessary sum of a column’s data. This example will remove gradient in the Logo banner so you can use a flat color. You can specify your own background color with this as well. This example will change the font style when you print a page. You can find a list of web-safe fonts here. These examples will allow you to hide specific parts of an Address field. This example will allow you to center a table's column headings. This example will allow you to remove white spaces from table headers. This example will allow you to hide the forgot password link from the Live App login pages. This example will allow you to hide a specific user role signup button, on your Live App login pages. The Knack community offers multiple resources to help build your app, discuss ideas, and share code libraries. Looking to get - or give - a hand? The Knack Builder Network is a network of vetted Knack builders that are available to help build your projects. On the other hand, if you would like to apply to become a Builder yourself, you can do so here as well. See our page on the Builder Network for more information. Knack has an outstandingly active community. If you're stuck and looking for a hand from a fellow Knack user - or looking to share your own knowledge - consider perusing or posting in our forums. Both the API & Customization and How Do I...? forums are great places to get and give help. If you've built something you'd like to show off and explain to other developers or builders, we'd love to see it in the Show and Tell forum! The following libraries have been created by Knack users to help connect different coding languages with the Knack API. Please get in touch if you've created a code resource that could help other Knack developers. WARNING: the following libraries are not officially maintained or endorsed by Knack. They may be in various states of completeness or functionality. Please direct any questions to their contributors.